This note analyzes recent trends in loan growth at domestic bank holding companies (hereafter, banks) and reviews factors related to bank loan growth such as capital and loan write-downs.2 The extension of credit has important implications for the health of the economy.3 For instance, if businesses and households do not have access to credit, they will be unable to make investments that foster economic expansion. Conversely, unsustainable growth in credit, which could be spurred by inadequate lending policies that fail to account for borrowers’ ability to repay, can lead to increased risk for individual firms and for borrowers that face financial distress and its adverse consequences. In addition, if financial firms fund risky loans with insufficient capital to withstand resulting losses, the financial sector is vulnerable to adverse shocks. Banks are an important source of credit to households and businesses. In the past three years, overall bank lending has been robust. Between December 2013 and December 2016, bank credit increased by more than 20 percent, roughly double the 11 percent increase for nominal gross domestic product (GDP).4 However, recent lending growth by large banks has been slower than growth at other banks. This difference in trends across large and small banks is consistent with such things as differing financial crisis experiences, regulations designed to make large banks more resilient to adverse shocks, and a reduction in the perception of too-big-to-fail (TBTF). Large banks had different financial crisis experiences from most smaller banks, and this experience may have shaped their post-crisis business strategy. In particular, large bank balance sheets were especially vulnerable due to high leverage, fragile liquidity structures, and large loan losses. Regulations such as supervisory stress tests, the liquidity coverage ratio, and extra capital requirements are only mandated for large banks. At the same time, a reduction in the perception of implicit government support for the largest banks would generally lessen any related funding advantage that large banks have over smaller banks. Overall, it is difficult to isolate the effect of any specific driver of the differing loan growth rates using the available data. Before turning to an in-depth analysis of post-crisis trends in bank lending, it is important to understand the overall structure of credit in the U.S. economy. 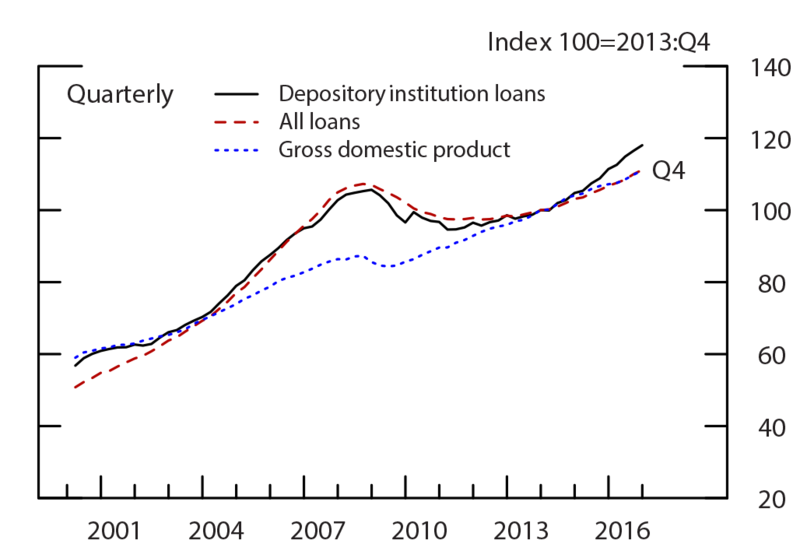 Figure 1 shows the path of loans and nominal GDP from 2000:Q1 to 2016:Q4.5 Loans provided by depository institutions (DI)–commercial banks, thrifts, and savings banks–are shown separately from all loans. Levels are indexed to 100 at 2013:Q4. As a result, the lines are tracking cumulative growth. 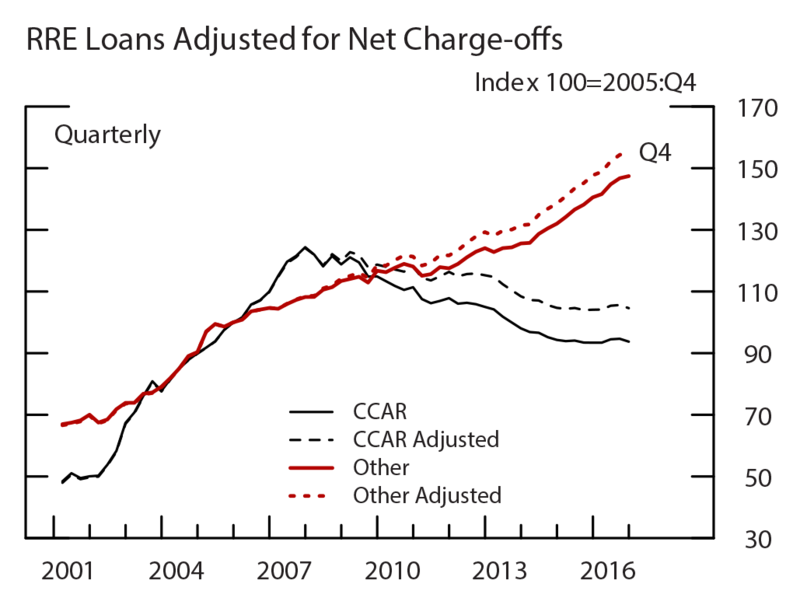 DI loan growth and total loan growth (black line and dashed-red line, respectively) had generally been the same priorto and during the financial crisis. In the run-up to the crisis, overall loan growth sharply outpaced GDP growth (blue).6 This potentially large and persistent excess of credit growth reversed during the crisis. Finally, note that in the past two years, DI loan growth is greater than GDP and total loans. In fact, DI loans have surpassed levels reached during the crisis. Table 1 shows the size of DI lending relative to total loans supporting the economy. Column (1) shows DI share of loans in 2006:Q4 just prior to the financial crisis, and column (2) shows the share in 2016:Q4. Over this time, DIs have expanded their role in nonfinancial business lending and consumer lending. The other shares are fairly similar, though residential real estate (RRE) loans have dropped a bit. In total, DIs have expanded their share of loans since 2006:Q4 with growth of 24 percent compared to total loan growth of 16 percent. Source: Financial Accounts of the United States, Bureau of Economic Analysis. Financial Accounts of the United States data are available here: https://www.federalreserve.gov/releases/z1/current/default.htm. Bureau of Economic Analysis, GDP, data are available here: https://www.bea.gov/national/index.htm#gdp. Source: Financial Accounts of the United States, Consumer Credit G.19 release. Federal Reserve, G.19, data are available here: https://www.federalreserve.gov/releases/g19/current/default.htm. Note: Loans include nonfinancial business loans (L.102), commercial mortgages (L.220), home mortgages (L.218), multifamily residential mortgages (L.219), and consumer credit (G.19 release). * Nonfinancial business loans defined as “Depository institution loans not elsewhere classified” and “Other loans and advances” in table L.102. Nonetheless, many stakeholders have expressed concerns that changes in regulation and supervision of banks have affected their lending. An analysis of this issue is important, as the enhanced prudential standards have focused on the largest, most systemic firms because of the fallout associated with their distress during the crisis. For example, building resiliency at the largest, most systemic banks is the main goal of the Federal Reserve’s Comprehensive Capital Analysis and Review (CCAR) and stress test exercises mandated by the Dodd–Frank Act. Some have suggested that the stringency of those stress tests and the identification of assets that are particularly sensitive to economic downturns have caused banks to change the way they allocate credit to types of borrowers, but this could be said of any potentially binding capital standard. This criticism also fails to account for one of the most important goals of stress tests, which is to determine whether a bank, and the system as a whole, has sufficient capital to continue operating and making loans to creditworthy borrowers throughout times of financial stress or a severe recession, like the recent one between 2007 and 2009, rather than pulling back from lending broadly and exacerbating the crisis. 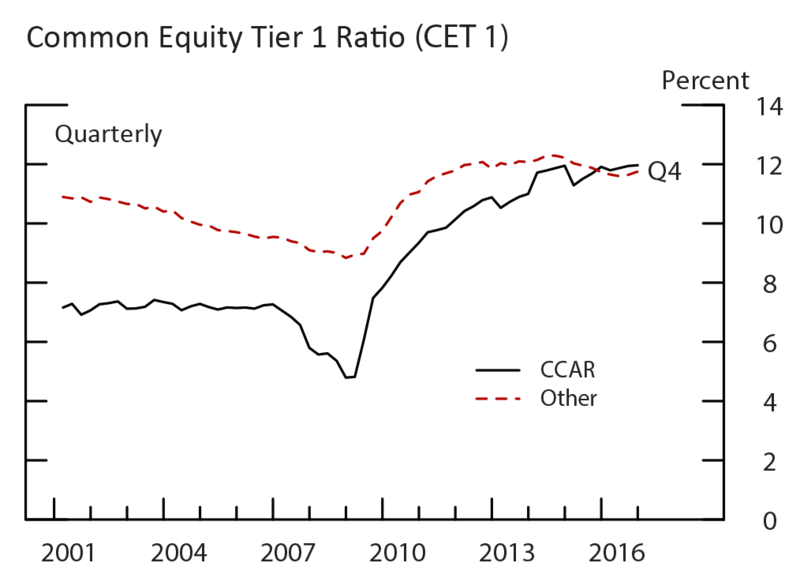 Note: Prior to 2014:Q1, the numerator of the common equity tier 1 ratio is tier 1 common capital. Beginning in 2014:Q1 for advanced approaches BHCs and in 2015:Q1 for all other BHCs, the numerator is common equity tier 1 capital. More information on the Federal Reserve, FR Y-9C Consolidated Financial Statement for Holding Companies, data is available here: https://www.federalreserve.gov/apps/reportforms/reportdetail.aspx?sOoYJ+5BzDal8cbqnRxZRg==. A related motivation of post-crisis banking regulation was to even the playing field between large and small banks.10 Given perceptions of investors that some banks were “too big to fail,” post-crisis financial regulations force large banks to fund their balance sheets with more capital, hold significant liquidity buffers, and to develop resolution plans. For example, the GSIB surcharge was calibrated to measure each GSIB’s expected impact on the financial system conditional on it failing (Board 2015). These regulations therefore help eliminate any unwarranted funding cost advantage that those perceptions confer on large banks. A Government Accountability Office study (GAO 2014) generally finds evidence that the recent regulatory reforms have reduced the subsidy relative to pre-crisis estimates. In addition, both Moody’s and S&P downgraded the debt ratings of some of the largest domestic banks in 2013 and 2015, respectively, citing that they were no longer confident that the U.S. government would step in to support those banks in a future crisis. As the funding costs and capital levels of large and small banks converge, one would expect smaller banks to be more able to compete for loans and grow faster, at least for a time, than large banks. 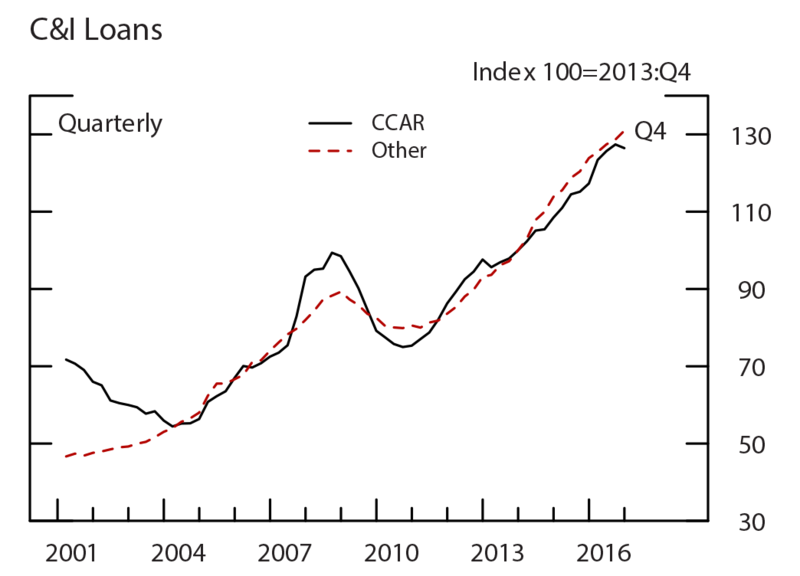 As shown in the top chart of figure 3, banks of all sizes have been growing loans since the crisis. Note that these data are again indexed, setting 2013:Q4 to 100. In addition, the growth rates used to construct these indexes have been adjusted for mergers such that organic growth is being measured. Growth through the purchase of loans in a bank merger is excluded.11 Organic loan growth is a better measure of the amount of new credit being extended in support of economic growth. 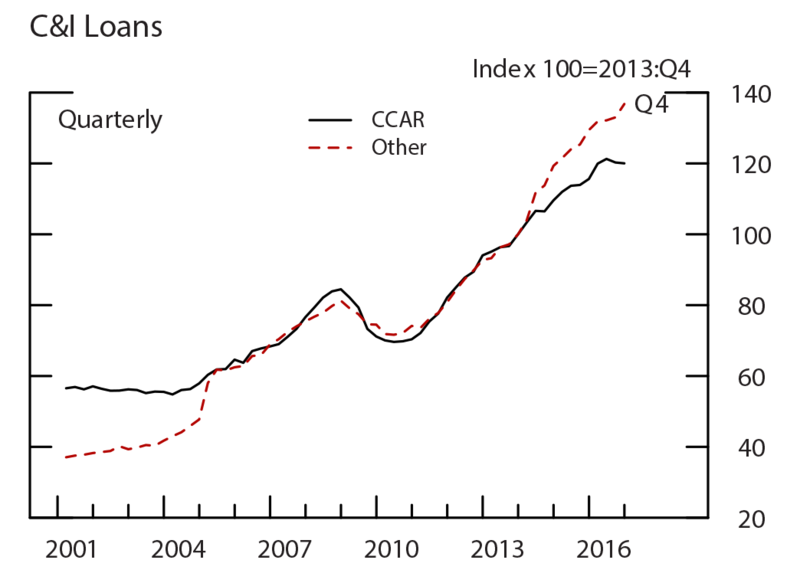 While CCAR banks have been increasing loans more slowly than other banks since 2014, faster growth by smaller banks during an economic expansion is not new. The smaller banks also had faster growth between 2001 and 2006. The bottom chart in figure 3 restricts the balanced panel to banks between $20 billion and $200 billion in consolidated assets.12 This creates a group of banks that are more similar and are around the $50 billion size threshold for being subject to supervisory stress tests. Banks above $50 billion are also subject to new post-crisis liquidity regulations, such as the liquidity coverage ratio (LCR). 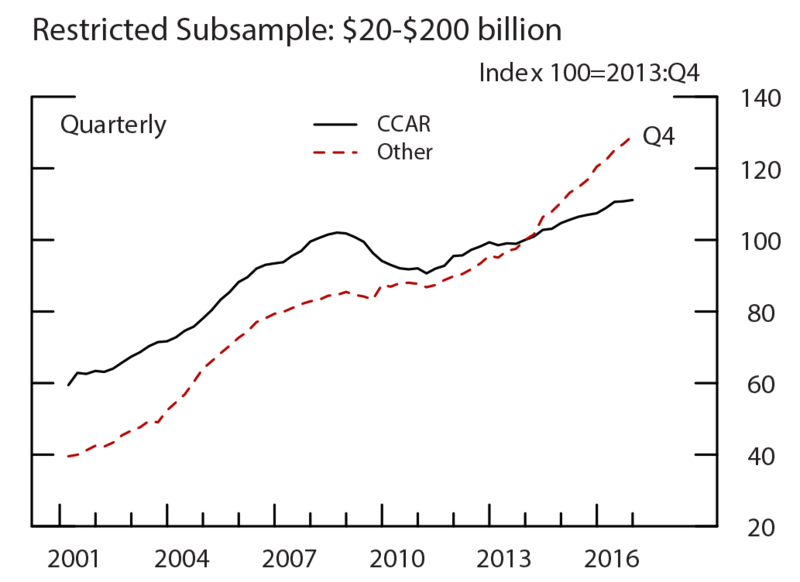 Within this subsample especially, smaller banks have much faster growth than CCAR banks, not only since the financial crisis, but dating back to at least 2001. Also note that the restricted subsample clearly indicates that the noncomplex CCAR banks experienced larger loan declines than the smaller banks around the crisis. Diving deeper into the loan portfolio, we will now look at four main loan categories: commercial and industrial (C&I) loans, commercial real estate (CRE) loans, residential real estate (RRE) loans, and consumer loans (composed primarily of credit card and auto loans). 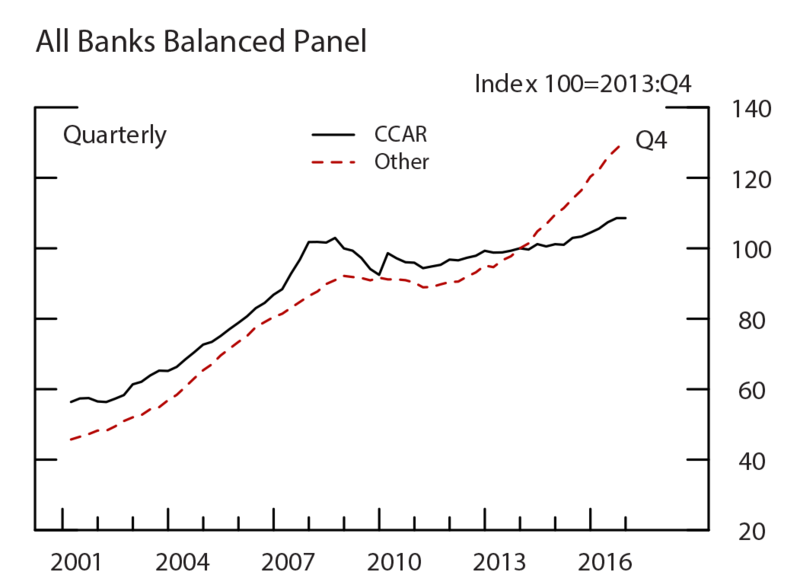 Figure 4 shows these loans for the same larger balanced panel used in the top chart of figure 3.13 Consistent with figure 3, smaller banks are growing loans more quickly than CCAR banks in three of the four main loan categories. The C&I loan category is the one exception (figure 4, top panel). Within C&I lending is small business lending, a type of loan that is of special interest because such businesses have limited opportunities to obtain financing outside of banks. Lending patterns to small businesses are similar to overall C&I lending. Figure 5 shows growth of C&I loans with original amounts of $1 million or less. Growth of small C&I loans at CCAR banks and small banks has been similar over the past five years.14 Yet, CCAR banks provided 2 times the amount of such loans in 2016. Note: The break in the consumer loans series is due to FAS 167. Note: Small business loans are loans with an original amount of $1 million or less. More information on FFIEC, Call Reports, data is available here: https://cdr.ffiec.gov/public/. As shown in figure 4 (second panel), CRE lending has been consistently weaker at CCAR banks than small banks, showing slower growth before the crisis and in the past five years. 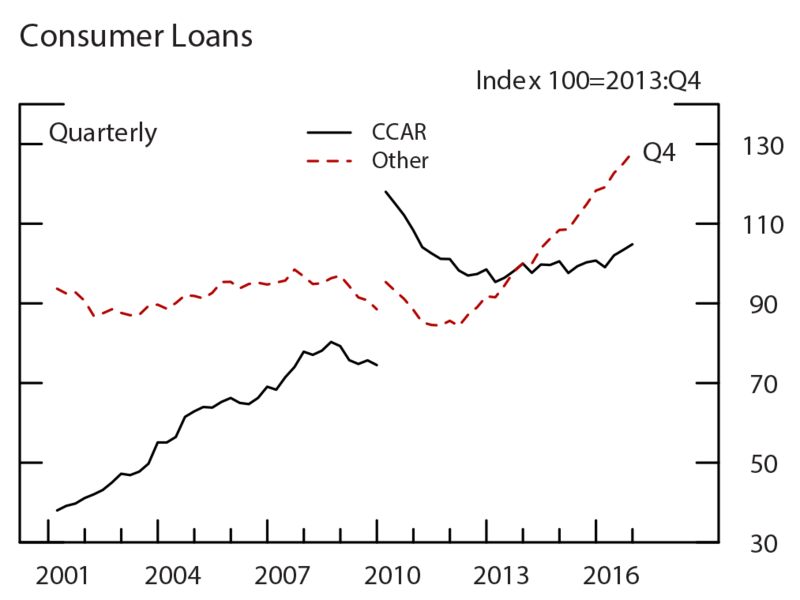 In addition, the largest declines during the crisis occurred at the CCAR banks, suggesting larger loan write-downs, perhaps due to weaker underwriting. 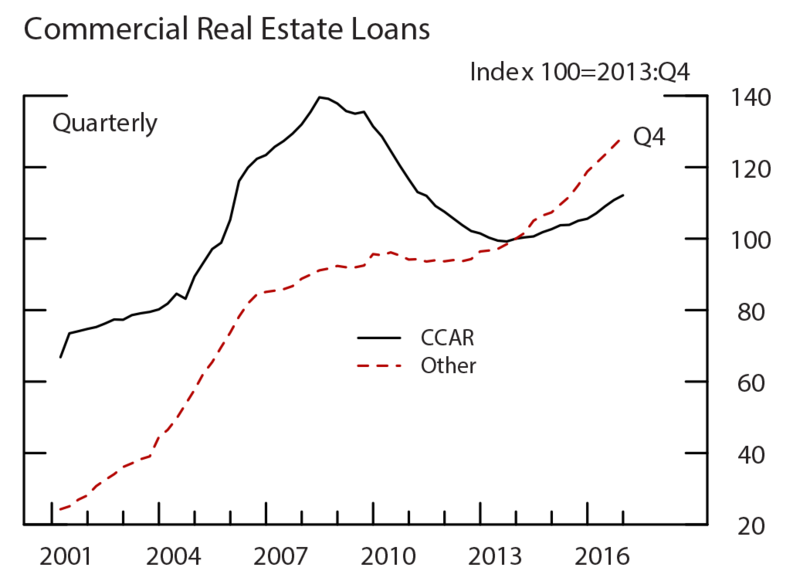 Figure 6 shows CRE loan growth for the restricted subsample. As in the all banks balanced panel, large banks had less growth than small banks throughout the time period, not just in the post-crisis environment. The consistently stronger growth at smaller banks may be because they have comparative advantages over large banks in CRE lending (Bassett and Brady (2001) and Keeton et al. (2003)). 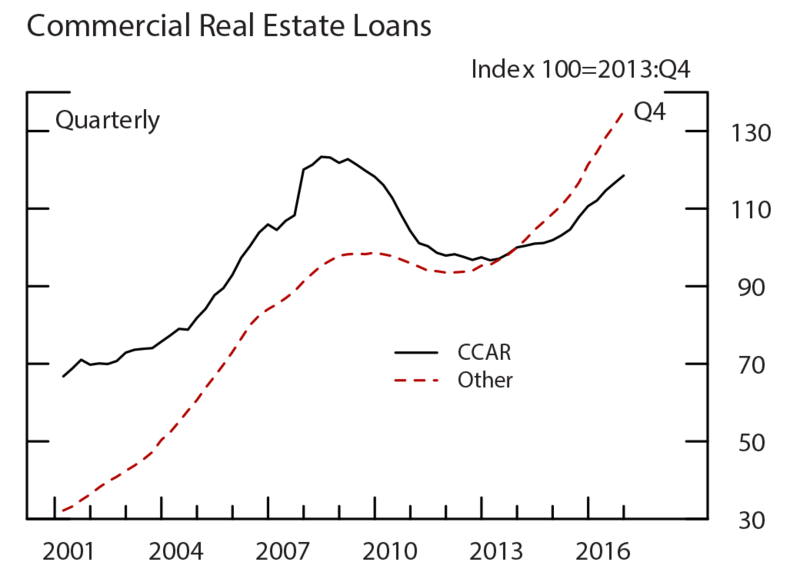 Though loan growth has been slower at CCAR banks, banks in that group have been reporting an easing of lending standards on CRE loans. As shown in figure 7, according to the Senior Loan Officer Opinion Survey (SLOOS), larger net fractions of CCAR banks consistently reported having eased standards between 2010 and 2015 than those of smaller banks in the survey. 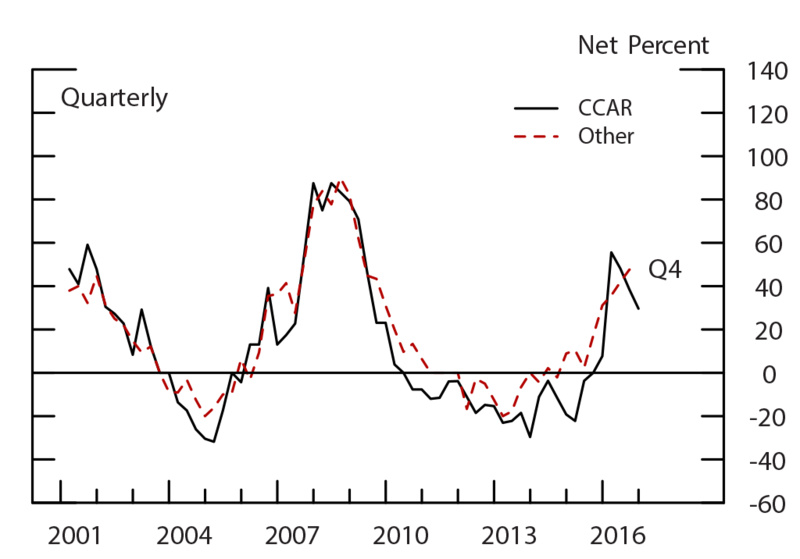 This pattern suggests that CCAR banks have been competing aggressively for new CRE loans, an action that would be inconsistent with banks that were constraining CRE lending as a result of capital requirements or other financial regulation. More information on the Federal Reserve, Senior Loan Officer Opinion Survey, data is available here: https://www.federalreserve.gov/data/sloos/sloos.htm. The final loan type that this note will highlight is residential real estate loans. 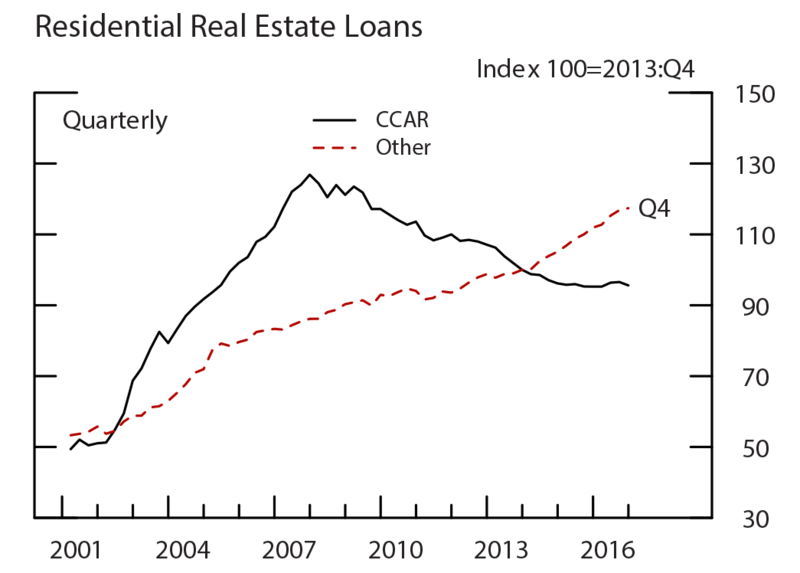 As shown in figure 4 (third panel), RRE loans at CCAR banks in the balanced panel rose precipitously prior to the crisis, dropped steadily through 2014, and has leveled off in recent years. The largest banks’ current appetite for RRE loans is likely affected by those crisis lending experiences–excessively easy credit standards led to painful losses when assumptions about house prices proved faulty and exposed weaknesses in underwriting and other risk management practices. 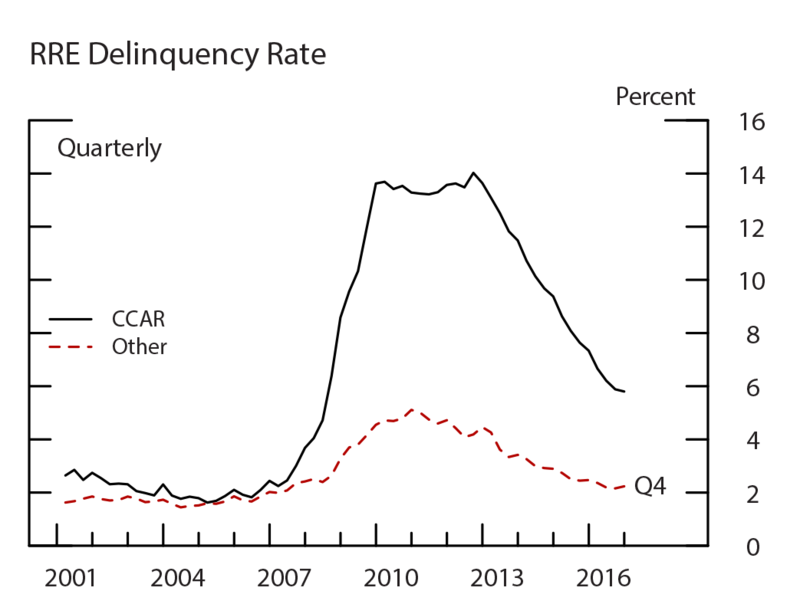 Indeed, delinquency rates are still elevated at the CCAR banks, as shown in the top panel of figure 8. 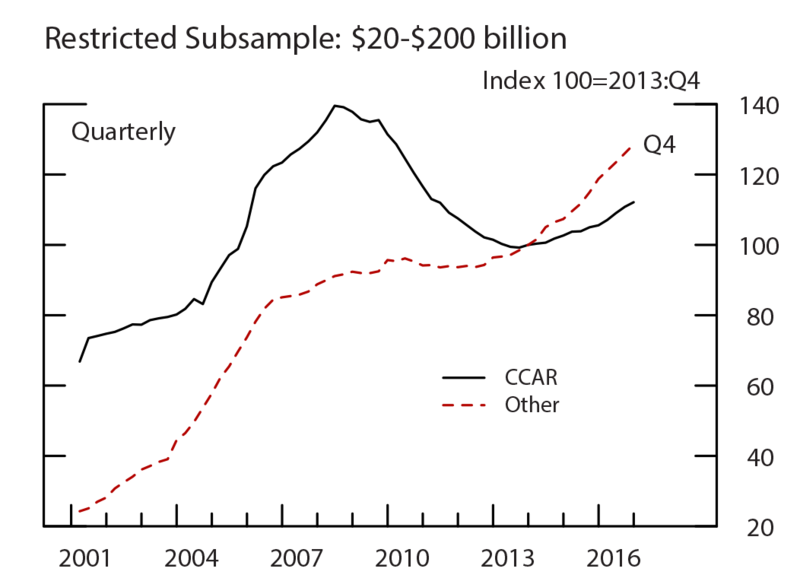 In addition, between 2009 and 2012, CCAR banks had to repurchase $82 billion RRE loans. These repurchases were primarily due to breaches of representations and warranties associated with securitizations. From the perspective of loan portfolio management, high delinquencies and forced repurchases of loans for which risks were thought to have been transferred should result in more-cautious lending policies, even in the absence of changes in supervision and regulation. The bottom panel of figure 8 shows RRE loan growth adjusting for charge-offs. The reason for this adjustment is that it gets closer to a measure of new loan originations, which are more closely related to economic activity than the stock of on-balance-sheet loans.15 For this calculation, loans written-off by a bank as uncollectable are added back to the balance sheet for the growth calculation. Notice that the index is also reset to 2005:Q4 to make it easier to see the differing experience around the crisis by bank group. 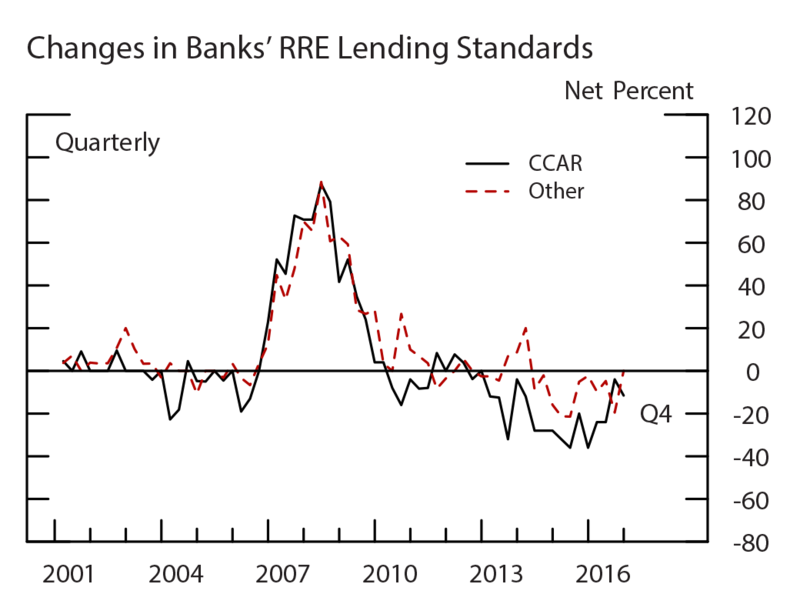 Using this adjusted measure, RRE lending at CCAR banks did not decrease as much during and following the crisis and has been about flat over the past three years. In contrast, RRE loan growth and adjusted loan growth for small banks are relatively closer. The differences in charge-off rates on legacy real estate portfolios add to the evidence that RRE underwriting of CCAR banks was less strict than that of smaller banks prior to the crisis. The lessons learned from absorbing the costs of that loose underwriting might be expected to have caused the large banks to tighten standards more than small banks during the financial crisis and remain tighter than smaller banks in its immediate aftermath. 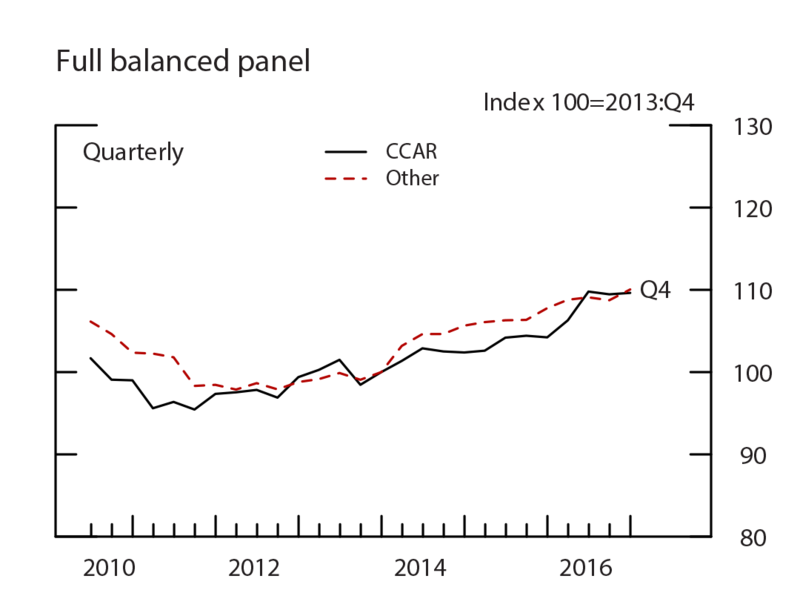 However, as shown in the top chart of figure 9, similar net fractions of CCAR banks and small banks reported tightening standards in 2008 and 2009. Since then, the pattern changed. A higher net fraction of CCAR banks have reported easing standards between 2010 and 2015 than small banks. 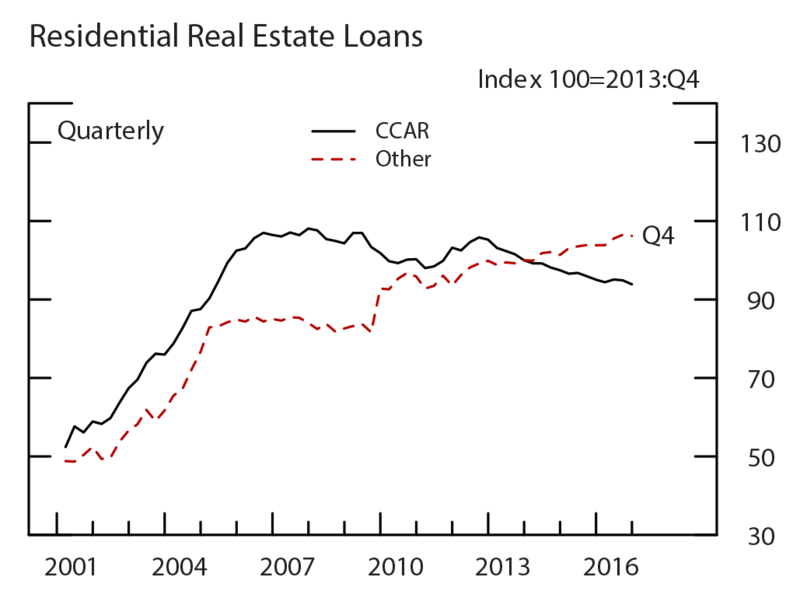 The most recent reading of the levels of standards, from the July 2016 SLOOS, allow us to gauge the net effect of the tightening and easing cycle from 2005 to 2016.16 In that survey, 40 percent of CCAR banks reported that standards for RRE loans were about in line with their longer run averages. The same was true for about 60 percent of the other banks. It is also likely that other regulatory changes such as the capital costs of mortgage servicing and consumer protection rules are affecting banks’ ability and willingness to make mortgage loans to certain borrowers. Generally, these regulatory changes encourage more sustainable lending practices and prevent the excesses of the mid-2000s. Moreover, even if these regulations are curbing credit availability from large banks more so than from small banks, banks as a group hold only a small percentage of overall mortgage debt in the form of mortgage loans. As shown in table 1, DIs provide 24 percent of that funding in the form of whole mortgages held on their balance sheets. That said, banks play an important role in originating loans that are ultimately funded by insurance companies or by investors holding mortgage-backed securities (MBS). Additionally, banks themselves hold a large amount of MBS, and bank holdings of both whole mortgages in their loan portfolio and MBS in their securities portfolio support the extension of mortgage credit to households. The bottom chart of figure 9 shows this more complete measure of mortgage credit support from banks. Under this new measure, CCAR banks have been increasing mortgage credit during the past two years. 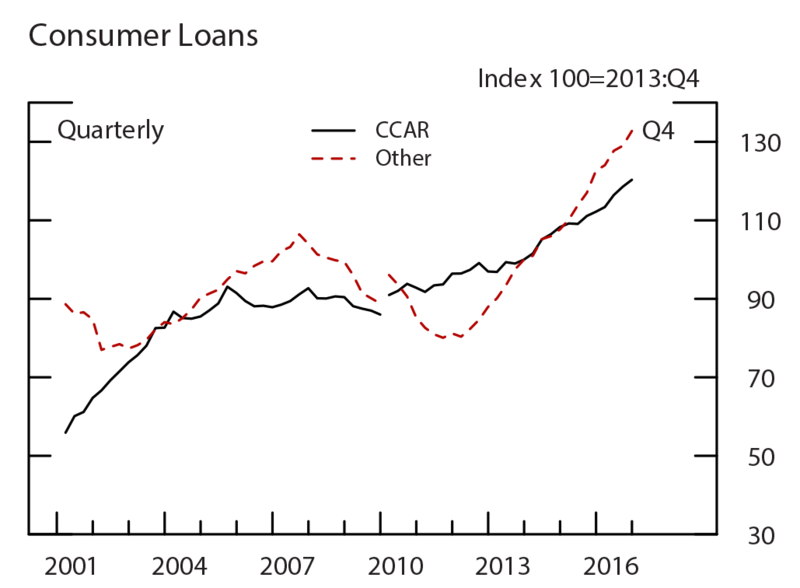 Loan growth at CCAR banks has been slower than at small banks in the past three years. This difference in loan growth is likely impacted by the different challenges banks faced during and following the crisis. Namely, CCAR banks are subject to more regulation but were also more financially vulnerable coming out of the crisis: CCAR banks had less capital available to fund loans, higher losses due to defaulted loans, and large legal costs resulting from their actions leading up to the crisis. In the case of RRE loans, CCAR banks had much larger charge-offs and continue to have higher delinquency rates than smaller banks. 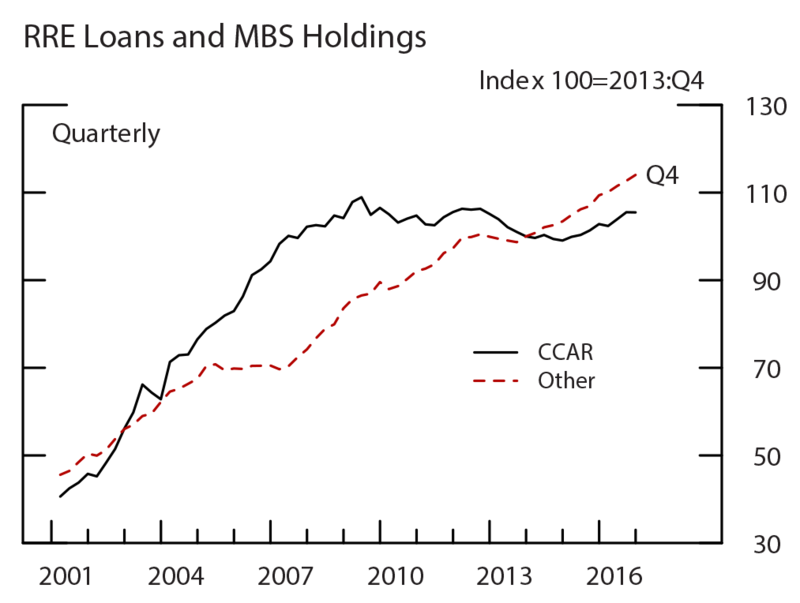 Nonetheless, CCAR banks have been increasing their holdings of MBS, which also contributes importantly to credit supply in this market. In terms of the overall health of the banking industry and the economy, the extension of bank credit has been growing faster than nominal GDP in recent years. Loans from all providers of credit have also been growing. In addition, regulatory programs such as stress testing help ensure that lending practices are sustainable and that lending capacity will not be disproportionately withdrawn in tough times. Such withdrawals of bank credit contributed materially to the recent recession and other credit crunches. Bassett, William F. and Thomas F. Brady. 2001. Board of Governors, “The Economic Performance of Small Banks, 1985-2000.” Federal Reserve Bulletin, November, pp. 719-728. Bassett, William F. and Marcelo Rezende. 2015 “Relation between Levels and Changes in Lending Standards Reported by Banks in the Senior Loan Officer Opinion Survey on Bank Lending Practices,” FEDS Note, January 16, https://www.federalreserve.gov/econresdata/notes/feds-notes/2015/relation-between-levels-and-changes-in-lending-standards-reported-by-banks-in-the-senior-loan-officer-opinion-survey-on-bank-lending-practice-20150116.html. Board of Governors of the Federal Reserve System (Board). 2015. Calibrating the GSIB Surcharge, July 20, www.federalreserve.gov/aboutthefed/boardmeetings/gsib-methodology-paper-20150720.pdf. Drehmann, Mathias, Claudio Borio, and Kostas Tsatsaronis. 2011. “Anchoring Countercyclical Capital Buffers: The Role of Credit Aggregates,” International Journal of Central Banking, December, pp. 189-240. Government Accountability Office (GAO). 2014. Large Bank Holding Companies: Expectations of Government Support, July, GAO-14-621, www.gao.gov/assets/670/665162.pdf. Keeton, William, Jim Harvey, Paul Willis, George A. Kahn, Linda Schroeder, and Stuart Weiner. 2003. “The Role of Community Banks in the U.S. Economy.” Federal Reserve Bank of Kansas City, Economic Review, Second Quarter, pp. 15-43. Tarullo, Daniel K. (2011), “The Evolution of Capital Regulation,” speech delivered at The Clearing House Business Meeting and Conference, New York, NY, November 9, https://www.federalreserve.gov/newsevents/speech/tarullo20111109a.htm. Please cite this note as:Vojtech, Cindy M. (2017). “Post-Crisis Lending by Large Bank Holding Companies,” FEDS Notes. Washington: Board of Governors of the Federal Reserve System, July 6, 2017, https://doi.org/10.17016/2380-7172.1985.